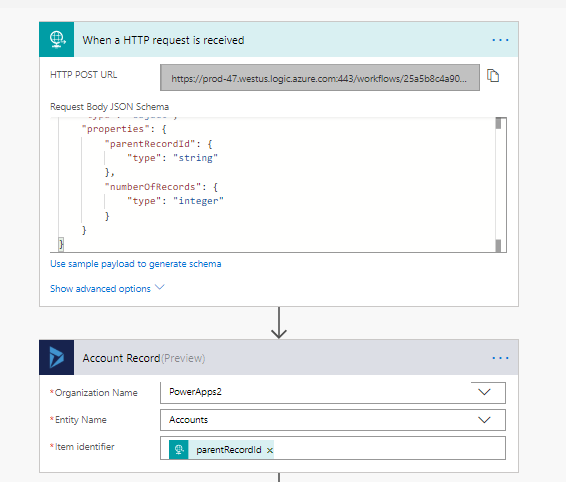 This is indeed my first blog in powerapps and guess what – one of the topics which I think is required for so many real time requirements as well as an interesting one. First of all, we all know that a multi-line of text field can be rendered as a pen input control and it can be easily rendered as a signature control. Unfortunately its not so easy if you plan to save some customer signature as a base64 string in multiline text field. 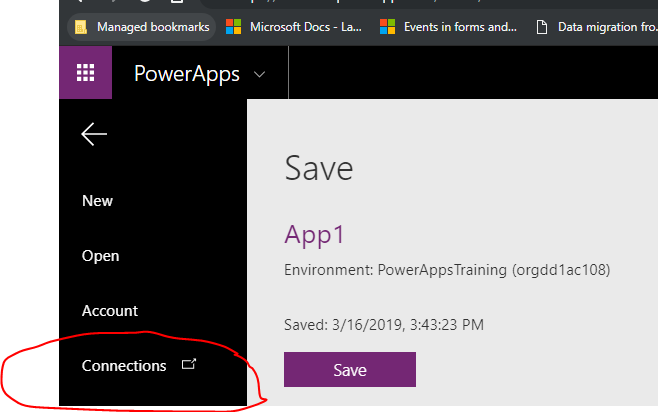 In this entire blog I am assuming you know how to build a canvas app using power apps and also is familiar with the pen control. So lets start with the problem first. 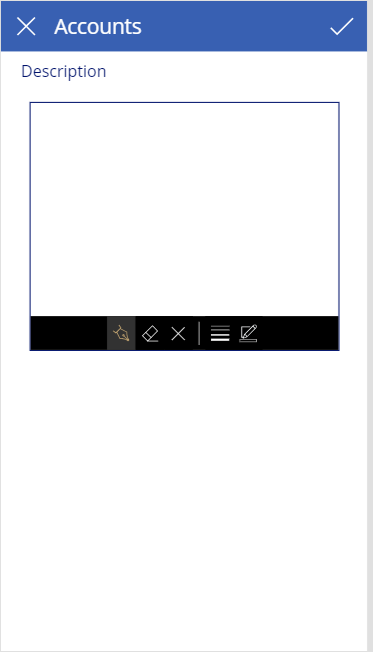 If you try to save the pen input image directly in the description field of the power apps, it won’t save as base64 of the image. It would render as //blobmanager/526….. I am not rendering the whole content but its kind of no use. What is the other option. The other option I tried out is to map this image to the default image field of the entity to see if it directly matches. Surprisingly not even that works.If you do that, you would not get any error. But it would always render a black content, something like below. Also it’s not an option since there is only one image field you can create for an entity and hence can’t store multiple signatures. So I started digging and digging and more digging. Finally came up with a solution which would be perfect fit for our beloved D365. Step : 1 Build the Power App screen to capture signature. Well I am leaving it to the fact that you already know to build a canvas app. And considering you know this, this is what the edit screen would look like mostly. You may have many controls. I have kept it to one. Also I will take the update scenario because doing this I can show you how to pass the record id as well. We will get to it later. Guid of the record to be updated. Any other fields that you want to update. For me, since I have no other fields on the form, it is just the first two parameters. I go to my canvas app and then select flows. 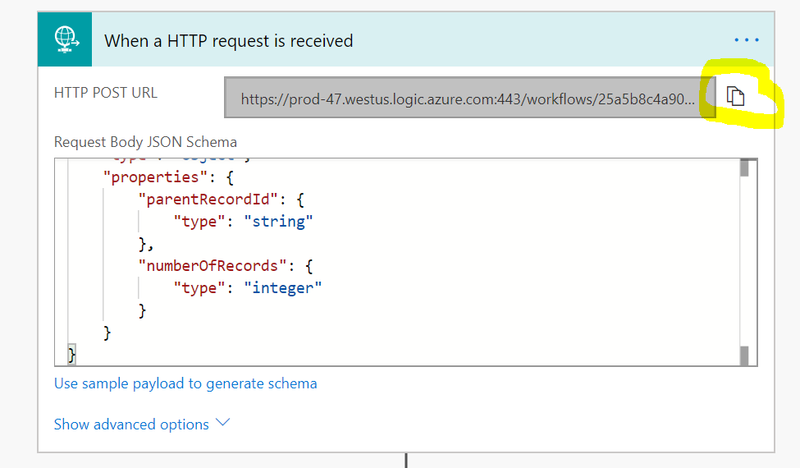 In the flows, since I would be posting the contents from my canvas app to the flow, I start with Request connector. I am assuming canvas app is sending the content of the image in body and then may be the record id as query parameter. So I need to take them in two separate variables in the Flow. So the next I use the Initialize Variable condition. Below shows setting the variable “Content” to the image content sent from Power Apps. All this may sound too over the top but believe me it will all make more sense once we bring all the pieces together. As of now just understand that the canvas app passed the signature and recorid and you just took back in the flow for further processing. 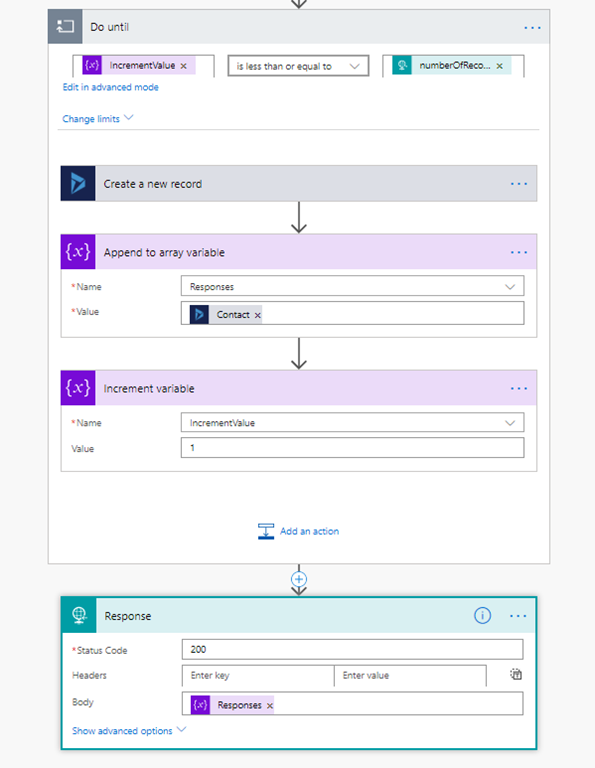 And the final step is use the Dynamics 365 update action to update the record. Here I have taken the account entity and I am going to save the signature from the canvas app to the description field of the account which is multi-line. I set the Record Id to be updated. And then our holy grail field, the description. And here is the expression to set it. All set and done. The next step is to connect the connector to connect the canvas app to the flow. Well this I found really hard to do. And my whole intention is that you don’t face obstacles like I faced. The connector will basically be used to connect the canvas app to the Microsoft flow. I go ahead and create a custom connector. Follow the screenshots below. 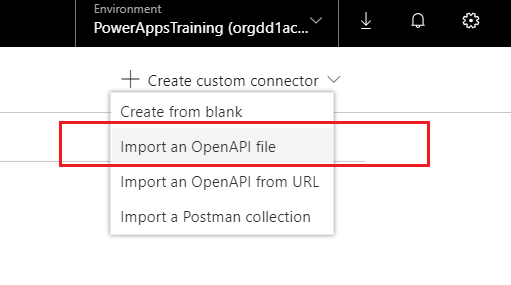 There are multiple options you get to create a connector but what we will do here is use the option = “Import an OpenAPI file”. But wait, where do I have the file. 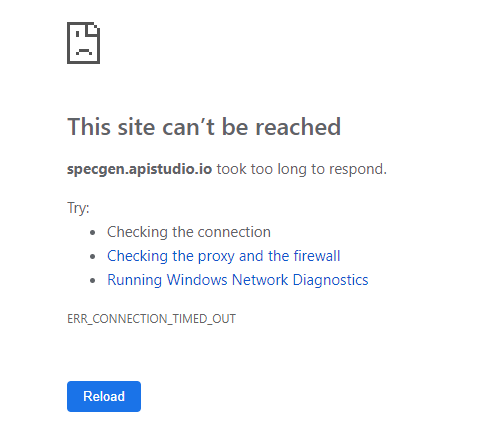 I need to create an OpenAPI file right. If you remember correctly, the first flow step was a HTTP step and it expects a certain protocol when it is being invoked. So why not get the URL that the HTTP is expecting. 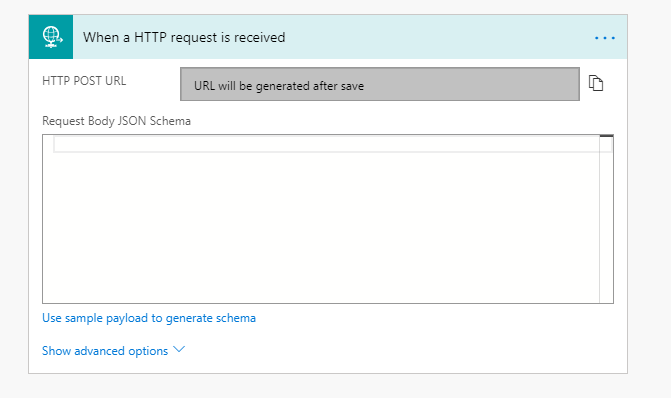 If we re-open our Microsoft flow then copy the request URL, then it would be something like this. So our open API schema should take mention of these four parameters. But how does we create the OPEN API file. It’s indeed a wonderful website where if you put the URL it would get everything working for you (not everything but well almost). Well I was not that lucky though. For entire 2 days or so, the site seemed to be down. It was nightmare to learn and search and put everything up. But somehow I managed. To keep this post short, here is the JSON file content which I uploaded as a separate link. Some important parameters which I have highlighted and explained below. title : This is the name with which the connector appears in the canvas app. operationId: the name of the function which will be invoked from canvas app. 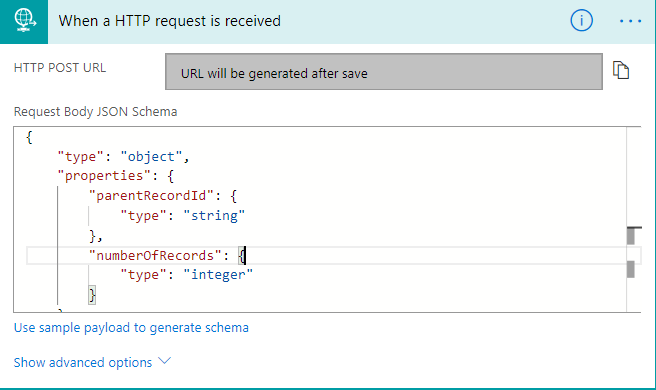 api-version, sp, sig and sv which are basically the query string parameters and the values you need to take from your URL which I have explained earlier. If you observe carefully, there is one attribute "x-ms-visibility": "internal" which basically specifies that the canvas app does not need to pass this value when invoking the flow. It would be set internally. Couple of more parameters – recordid and file which needs to be passed from canvas app. The file is of type formData which is basically a internal data type to support file content. I hope I was able to explain most of the stuffs. 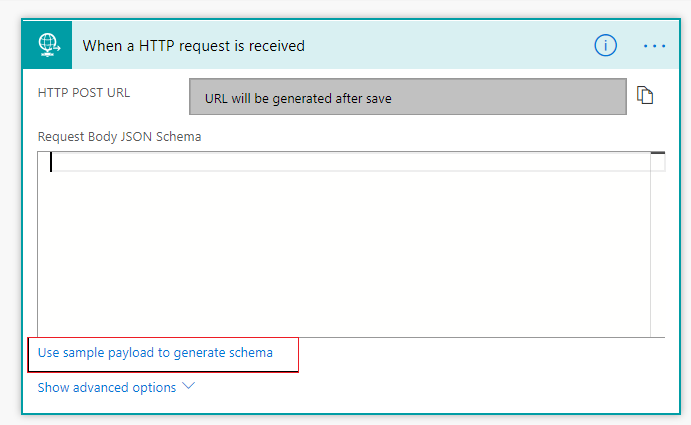 After replacing the URLs and the parameters with the values from your environment, save it and upload the JSON file. All set and done. Now the next step is to set-up this connector in canvas apps. 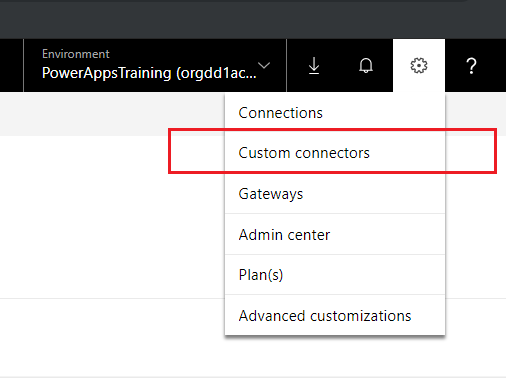 Step 4: Set the connector up in canvas app. Select your canvas app screen where you have put the pen control and then select new Data source. Search for your custom connector. It would appear. Select and Add. As you can see I am passing the record id through BrowseGallery1.Selected.Account. You may need to pass the recordid in some other way depending on how you arrived at the screen. I am passing “application/json” as the content-type parameter. And now once you run your canvas app and then check your CRM, you see this in your description field. Nirvana! And guess what, feels wonderful to put a smile on the face of the customer. And before I wind up, you might be wondering how did I come to the correct expressions while setting the variables Content and RecordId. 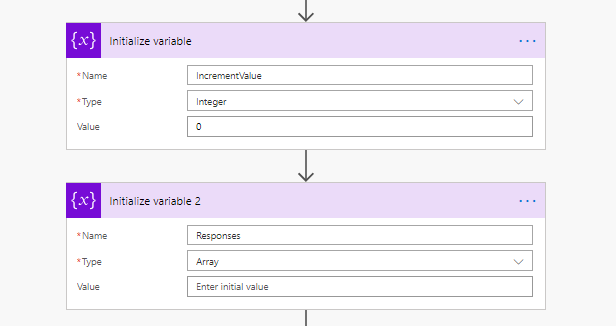 Once I execute the flow from PowerApps, below the output body I got. The explanation of the highlighted parts of is explained in the parent link. It gives me great pleasure to announce the new CRM add-on from XrmForYou stable – Notes Metadata Manager utility from XrmForYou stable. Well Notes (Annotations) have existed in CRM since pre-historic times. And perhaps one of the most widely used feature in Dynamics till date since its inception. After all it gives a nice way to store your documents along with some notes and description which can be read by CRM users. However with my many years in consulting, I realized the pain points of customers using Notes as well. 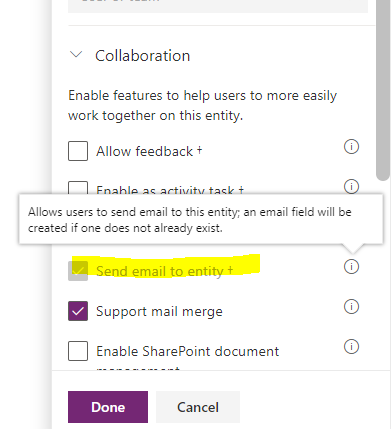 Can I add new fields in my notes entity (Annotation) to capture some extra information along with Note Title and Note Description? Can I put notes are separate from my timeline control? May be in a separate tab? Can I drag and drop documents in Notes section so that it will automatically upload? Can I create more than one Note record at a time with attachments? We have progressed leaps and bounds but even with the latest version the answer to most of the questions above is “NO”. Also traditionally since inception, Notes entity was not customizable to add new fields and users were just limited to using only two field “Note Title” and “Note Description”. Well, we have understood the pain and hence we have released this Add-On for you. It comes as a Managed solution. 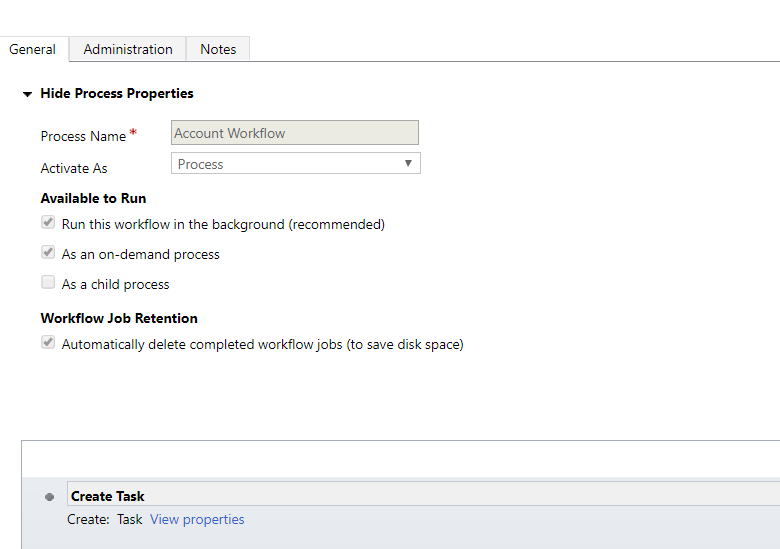 Once you install the managed solution and open up the solution configuration page, you get a screen like one below. The top section is the license information which will be provided by our team. The section below that shows all the entities which have been enabled for Notes. 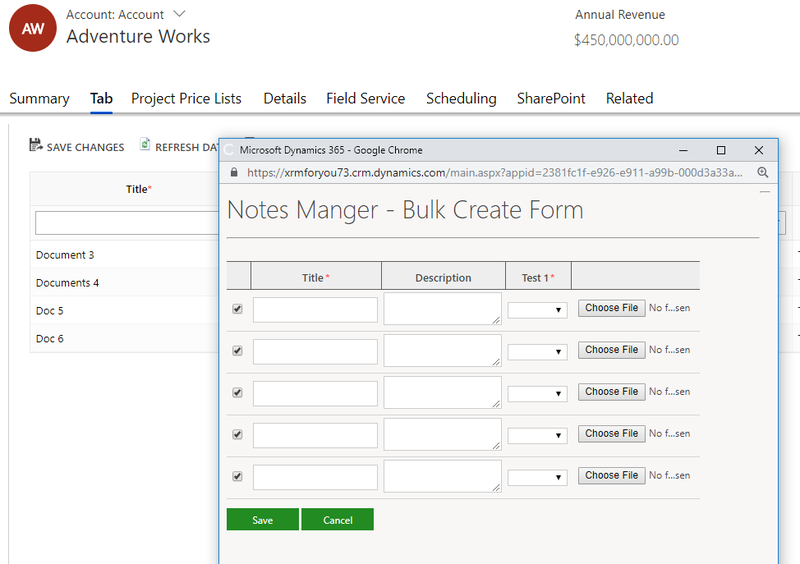 This is the area where you can configure additional metadata for your Notes records corresponding to each entity. 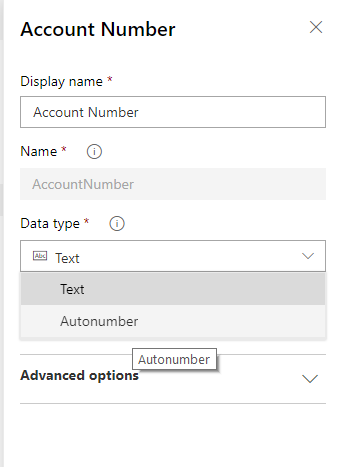 I click on Account entity and the existing metadata account shows up as shown below. You can create up to a maximum of 10 additional metadata records as per the current release of the tool. The metadata currently supported are of type text and optionset. 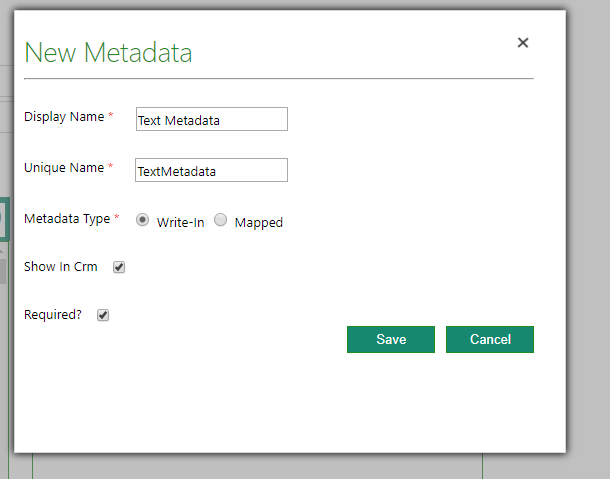 Above is the way to create a text metadata. Also you can make the additional metadata mandatory to be entered during record creation by setting the Required? field to checked. 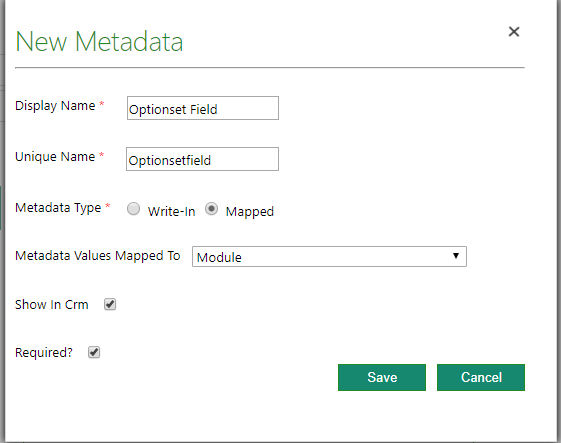 Below is the way to create an optionset metadata for your note record. As you can see from above you can configure any global option set and map your Optionset Metadata with that global optionset for the list of possible values. You save your metadata and that’s all from the Configuration Page. Once the webresouce is inserted on the form, this is how it looks as shown below. Below are the screenshots in the Unified Interface environment. 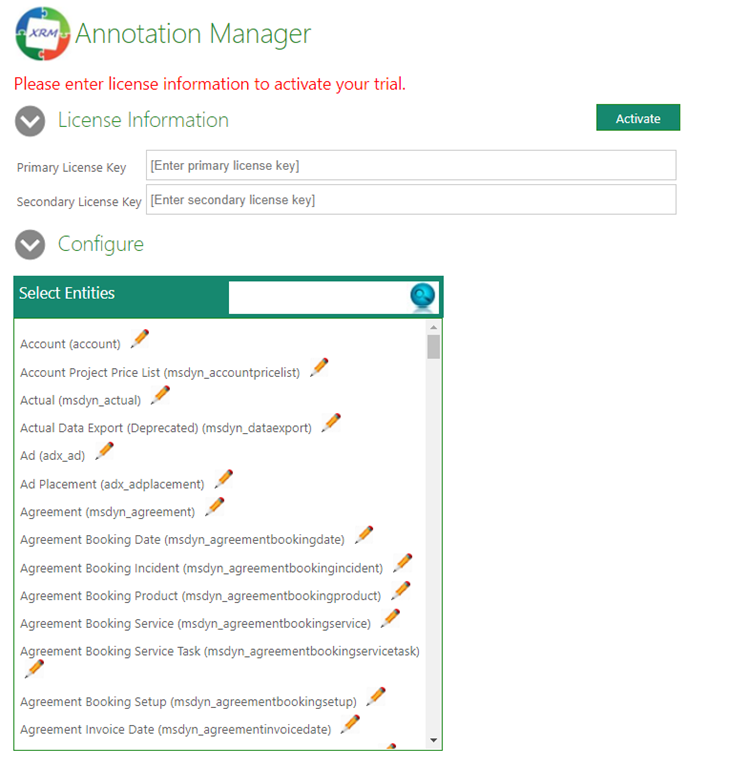 Inline editing of Note title, Description and metadata.